Man Plus: where Larry Grayson meets C3-PO. I say sir – I AM being served! The huge purple glowing things aren’t freaky enough: they’re supposed to be huge, glowing, purple, insectoid, faceted things. The rest of the picture looks like, well, like the artist never bothered to read the description of the person (s)he was depicting. But what’s new there? The campy pose is quite apt though really it should be more moping than campy. He’s quite a jaunty cyborg for one with no clothes, no skin on his left arm and loofahs where his eyes ought to be! I shrink under the scrutiny of his exfoliating gaze! Man Plus?! more like Man Minus…. What good is having a muscley plastic exterior if you go and leave it on the dashboard of somebody’s car on a hot day? Is that a giant ham sandwich in the background? I think it’s supposed to be a mushroom cloud. A really badly painted one. I want to say the the threat of nuclear war was a driving factor in the book’s plot, but I haven’t read it since I was a kid. Or maybe it’s an even worse representation of Mars itself rising in the background, back behind the Martian landscape and Martian cyborg of the foreground… which would make about as much sense as anything else about this cover does. Mars is REALLY close to Jupiter in the future. @Tag Wiz: Another weird pecs specimen for you, fine sir. Sterling work, FÃµM! 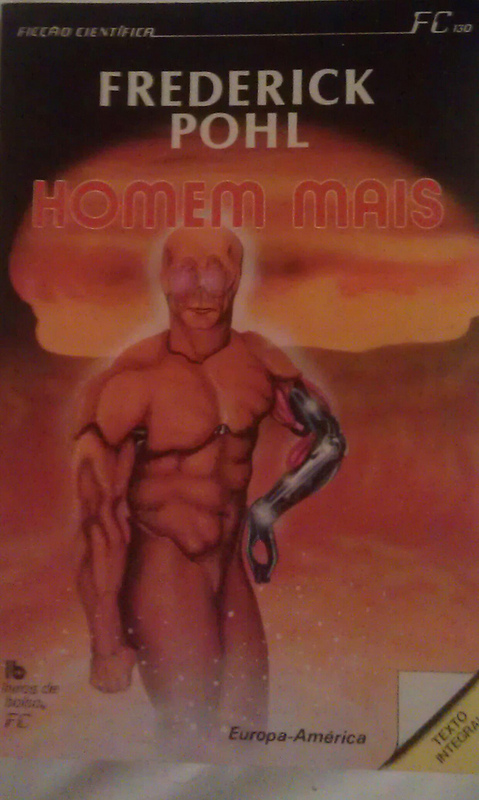 I shake Homem Mammaros’ wobbly, melting pec at you in appreciation.